Most may be familiar with guitarist, composer, and producer Dario Mollo's work with The Cage with Tony Martin and Voodoo Hill with Glenn Hughes. But his rock roots go back much farther, to 1981 and his first band Crossbones which released their first studio album in 1989. Nearly 30 years later, Mollo has resurrected the band with original drummer, Ezio Secomandi, longtime musical partner Dario Patti on bass and keyboards, and Carl Sentance (Nazareth, Don Airey Band, et al) on vocals. Rock The Cradle is the new album on the Frontiers Music label. Two things can be said at the start. First, with Mollo at the helm and on guitar, the music within Rock The Cradle is very much guitar-forward. The centerpiece of every arrangement is, first, the brisk, sometimes sharp, often heavy, but always harmonious riffage, and then second the abundance of spine-tingling lead solos. This is not to say that the other members are merely taking a back seat. Nope. Secomandi commands some impressive drumming through out, laying down some nice tempo, rhythm and groove. Patti slides in some nice keyboard work adding color to the arrangements. Sentance is a strong melodic vocalist, who rises easily above Mollo's nearly omnipresent riffage to carry the melody and deliver the ear pleasing hooks of the refrains. The second thing to note is simply the style of the music. Mollo, in composition, doesn't stray far from his early roots. The songs, in arrangement, are essentially an entertaining and pleasing mixture of classic hard rock and melodic heavy metal. Put another way, this is guitar-centered melodic heavy metal with a hard rock groove, yet also large on harmony, melody, and groove, giving them an AOR wrapper. This comes out with songs such as Take Me High, Rock The Cradle, or In My Blood. Something closer to "heaver" metal comes with Fright with it's deeper sound and slower pacing. Alternatively, Speed lives up to it's name. Quick and bracing, it races from the start thundering drums, sharp riffage, ripping solos and, shortly after the midpoint, a fine keyboard from Patti. This song was definitely a favorite. Another would be the hard rock heavy metal anthem Gates Of Time. Embellished with synth orchestration, but not forgetting Mollo's fine guitar work, the depth and strength of Sentance's vocals are the commanding presence. Suffice to say, if you liked anything I said by way of description, notably "guitar-centered melodic heavy metal with a hard rock groove," you will enjoy Dario Mollo's Crossbones and their new album Rock The Cradle. Easily recommended. 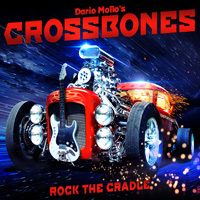 Suffice to say, if you like guitar-centered melodic heavy metal with a hard rock groove, you will enjoy Dario Mollo's Crossbones and their new album Rock The Cradle. Easily recommended.